It seems that our ancestors were making use of glass for ages, probably even as hunter-gatherers. Historians inform us that a natural form of glass called obsidian forms in the mouth of a volcano. It is the result of the intense heat of an eruption of melting sand. Early humankind put it to good use as spear tips. Archaeologists have unearthed evidence of manmade glass in the form of glazes used for coating stone beads as far back as 4000 BC. Fast forward to around 1500 BC, when the first hollow glass container was made using a sand core covered with a layer of molten glass. Fortunately, at least for our modern generation, glass is one of the most versatile construction materials available. It has multiple uses in and around our homes and its natural composition means it is design-adaptable. It has so many uses in everyday life. Glass offers many home design possibilities. It helps create open, airy spaces, and offers a cool, minimalistic feel. Alternately, you can use glass to replicate classic, traditional designs. Easy to clean and maintain, glass is suitable for any environment with proper fitting and the correct glass type. This article reviews four creative and innovative ways to use glass in your home design in unique and effective ways. Modern glass surfaces are flawless in appearance and are perfect in the hygiene sense for use in any room, including of course, bathrooms and kitchens. Finished glass surfaces are often transparent to provide that minimalist effect. Variations on the ‘clear’ theme include frosted glass - sand blasted or plastic-coated for privacy areas – and even stunning painted finishes to provide a splash of color. Glass mosaic tiles not only offer a dazzling, seamless finish, they are hygienic and easy to clean too. Modern glass surfaces are generally manufactured using tempered glass for extra strength, and security. This toughened finish copes well with extreme temperature variations, and can withstand impact and force more readily than the plain glass of yesteryear. Beautiful glass surfaces are now the fashionable statement in kitchen and bathroom design, as they contribute in creating a lovely ambience. Unlike conventional wooden structures, glass railings help create an unobstructed and stunning view from your balcony. It’s talented touches like this that make an eye-pleasing first impression, and it adds value to your property in the process. Have you ever thought of a glass floor? Imagine the effect of admitting light to the lower levels, or for spot lighting a well-stocked wine cellar. Take it a step further by using interior glass walls for creating a seamless interface between rooms, yet more ways to use glass! Home, as well as office space is benefitting more and more from the use of glass for exterior finishes. Imagine the ability to effortlessly eliminate walls in a few hours, and enjoy more fresh air and natural sunlight. 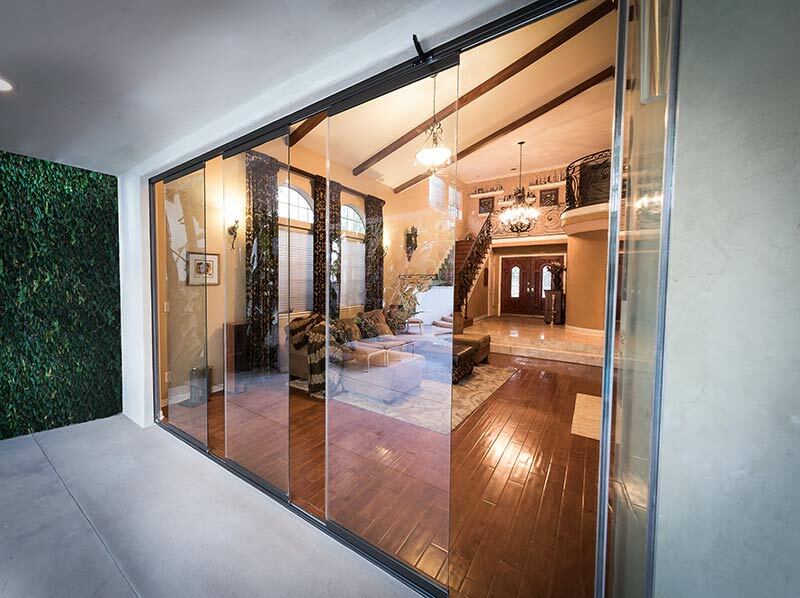 Frameless Sliding Glass Door Systems do just that and help transform the way you live. 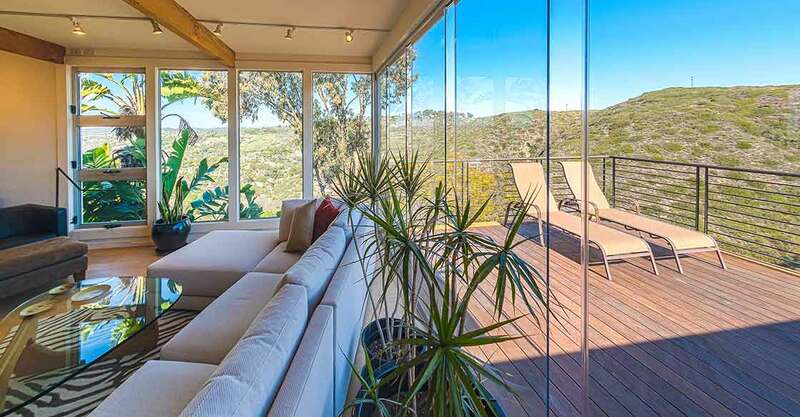 This 'open concept' glass door system freely slides and stacks at a 90˚ angle on the side. Opening to either the inside or the outside, each glass panel slides individually to the left or to the right, allowing the user to open the system to their preference. This creates unobstructed views that completely transform spaces, allowing a more open lifestyle. The use of glass in furniture construction is not new. Beautiful glass furniture is not only eye-catching; it enhances the impression of open, well-lit space, particularly in smaller living areas. Mirrored closet doors in bedrooms create the impression of infinite space, while improving natural light during the day. It all goes to prove that glass is one of the most versatile materials available for home design, offering the best of both worlds, depending on transparency versus reflective properties. Glass Enhances Life Perhaps we take glass for granted, perish the thought! With so many ways to use glass creatively in our homes, we ought to be humble about the amazing qualities this building material brings to modern living.